The American Carbide Tool carbide-tipped square nose lathe tool bit has a C style with a neutral-hand cutting direction and a K68 grade for forming, turning, facing, chamfering, and grooving applications on cast iron and nonferrous alloys. The C style, also called square nose, tool shape has a 0-degree nose angle and provides a neutral-hand cutting direction for right-to-left or left-to-right feed. The tool tip is made of Kennametal K68 grade uncoated carbide for good wear resistance and is brazed onto a steel shank for strength. The square shank fits square toolholders. Brazed tools, also called carbide-tipped lathe tool bits and single-point brazed carbide-tipped tools, are used for metal shaping on lathes. These single-point tools have a cutting edge at one end that is a carbide tip brazed to a steel shaft. They come in multiple geometry styles for different cutting applications and are identified by a lettering standard that conforms to American National Standards Institute (ANSI) B212.1 specifications. Brazed tools are available in three hand options: right, left, and neutral. A right-hand tool has its principal cutting edge on the right side of the tool to feed into the workpiece from right to left, a left-hand tool feeds into the workpiece from left to right, and a neutral-hand tool will cut either left to right or right to left. The side cutting and end cutting edge angles, in combination with the angle at which the tool is positioned in relation to the workpiece (also called the lead angle), help determine the tool's cutting shape and action. 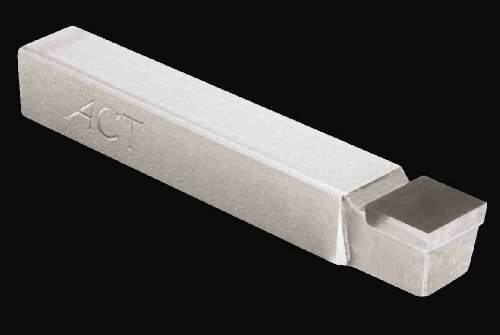 American Carbide Tool manufactures standard single-point brazed carbide-tipped tools, and precision ground cutting tools and inserts. The company, founded in 1953, is headquartered in Canton, OH. If you have any questions about this product by American Carbide Tool, contact us by completing and submitting the form below. If you are looking for a specif part number, please include it with your message.